People often ask if there is a difference between scallions and green onions. Actually whether they’re called scallions or green onions seems to be largely a matter of where you live. In the mid-Atlantic coastal states and New Englandthey’re more likely to be called scallions; everywhere else, they’re green onions. They are part of the Allum family which also includes garlic, onions, leeks, ramps, chives, and shallots. Both the onion bulb and the greens can be used in recipes and eaten. In recipes, especially stir fries, calling for onion, chopped scallions make a great substitute. Finely chopped scallions added to some cream cheese + bagel = Yum! Scallions have a milder taste than onions. 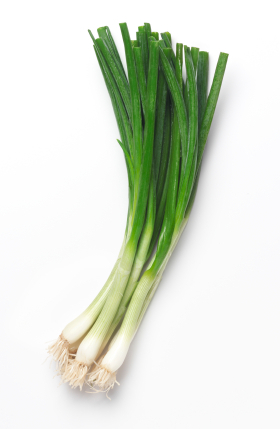 Storing : Scallions can be stored up to one week in the refrigerator. Remove any rubber bands, and store unwashed in a plastic bag in the crisper drawer.